Total Flexibility, with wireless and batteryless components! 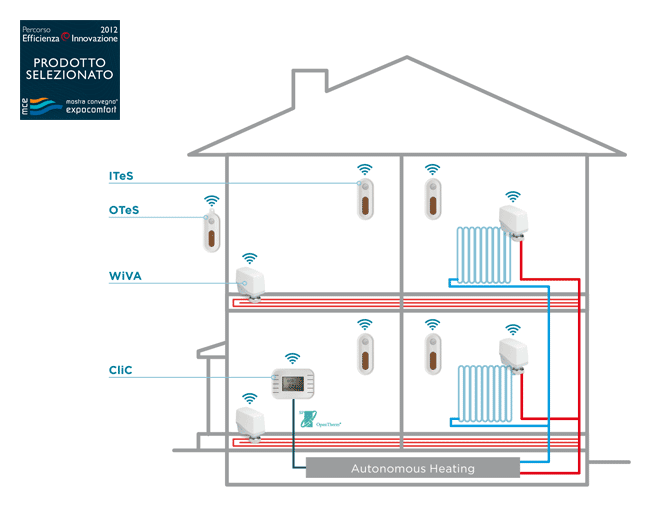 Fit with needs of automation and energy retrofit of existing houses. Satisfy and high performance requirements of new nearly zero-energy buildings. Provide repositionable sensors to put where needed, on every surface. Mean no periodic maintenance for battery replacement. Are Easy-to-Install thanks to its intuitive touch interface. Give you freedom to design and change your house. And when your needs increase, follow you in your new house. Easy to save money and the environment! Natively integrate renewable resource usage. Fit with all the requirements of Energy Performance of Building. Give you immediate savings, access to tax relief and more value to your real estate. Being the natural companions in your path towards the Class A. And with MilkyWay you are looking ahead, to the smart grids integration. Sit on your sofa and take a look to your MilkyWay house. Comfortable and always operating with the less of energy and cost. Respectful of the environment, like you are. Always under control, also with more guests or exceptional usage conditions. Connected to you always, also when you are away. Connected to the Smart Grid and to your Service Providers at your needs. Always in evolution like you are, changing at your needs and at your desires, because it is flexible. Getting the best from energy automation at a touch of your finger. With MilkyWay you will be able to plan, monitor and automatically control comfort, energy generation and energy consumption for any type of energy load, both locally and via the Internet. MilkyWay fits with centralized and autonomous plants. We can also help OEM manufacturers to project smart HVAC appliance that leverage on wireless sensors and wireless connectivity to enable automation. 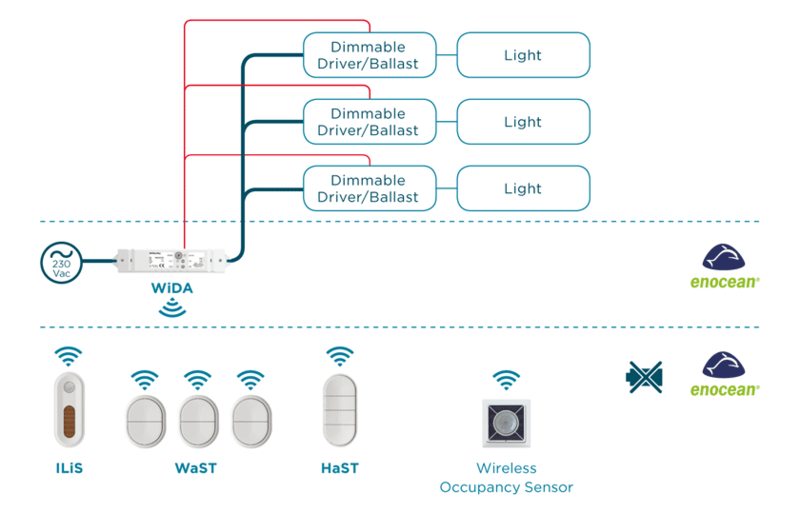 With MilkyWay OEM manufacturer can realize innovative smart LED appliance, leveraging on high electronic integration of LED drivers with dimming and wireless controls. Off-the-shelf solutions can also be provided, fitting to light appliance with false ceiling and shelves mounting. Both can leverage on wireless and battery-less sensors and controls and be integrated with automation solutions. 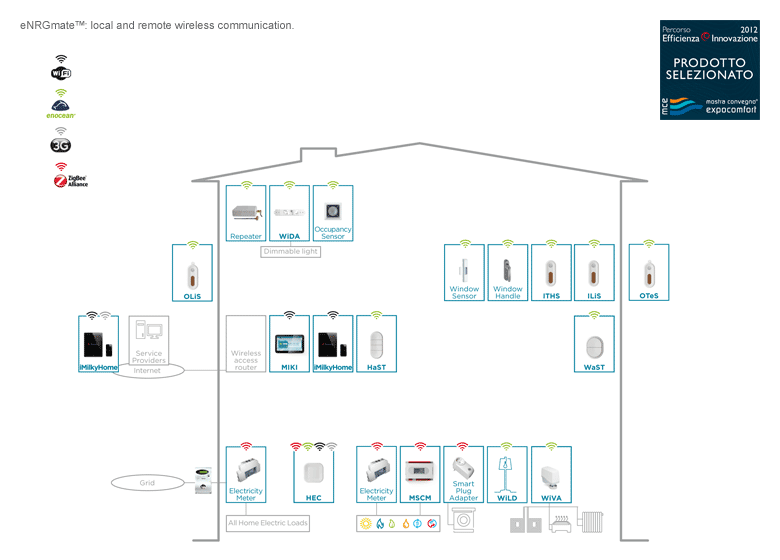 MilkyWay products adopt open interfaces and standards like Enocean, ZigBee Home Automation and Smart Energy Profile, WiFi. MilkyWay solutions directly integrate third party products like smart meters, window, handle and presence sensors. This is the way to provide a large product range and a leveraging a large ecosystem. Open solutions means also open to smart appliances integration. MilkyWay provides open solutions for comfort, lighting and energy control. All MilkyWay solutions are easy to install and to use, non-intrusive (no wiring and no breaking into walls and ceilings) and maintenance free, thanks to wireless sensors without battery. Thanks to the protocol interfaces based on open standards, MilkyWay products are interoperable with products of other manufacturers and MilkyWay solution are open to third-party components. BRITEmaster™ is the simplest lighting solution for light control full wireless and without batteries. CLIMEbuddy™ is the simple comfort solution for thermoregulation (heating and cooling). eNRGmate™ is the comprehensive solution for energy, lighting and comfort. MilkyWay solutions are flexible: it is possible to start with a simpler solution and enlarge it when needed, adding components and functionalities. Lighting solution for autonomous wireless control of dimmable and non-dimmable lights (230Vac supply) and smart LED lights. Autonomous wireless light point control for dimmable lights appliance. Autonomous light point control of wireless smart LED light appliance. 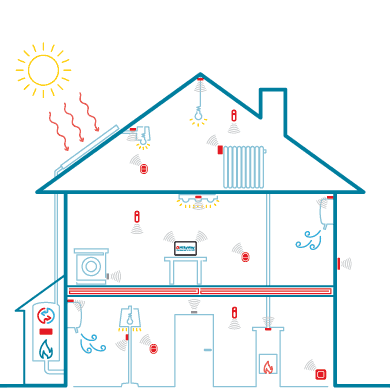 CLIMEbuddy solution offers an “easy-to-install” home wireless system for the regulation of multi-zone comfort through wireless and battery-less sensors and wireless actuators. Easy to use, it offers a single weekly programming and control point for up to four wireless zones. Applicable in houses with central heating/cooling systems with radiators and fan-coils and autonomous heating/cooling systems with every emission system. Perfect for retrofit in apartments and houses with radiators in column. 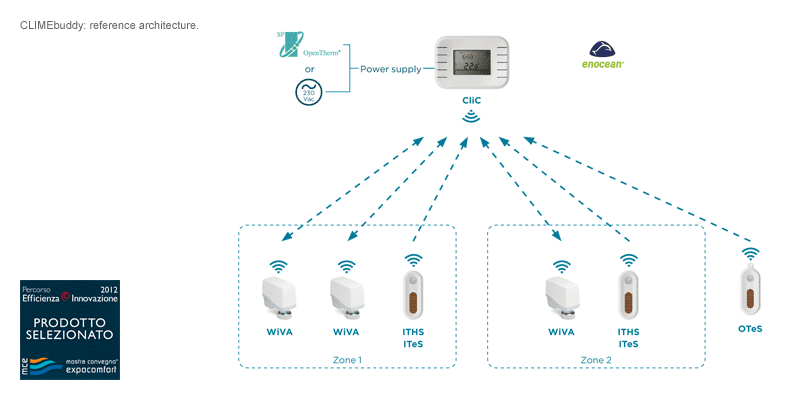 CliC, WiVA, ITHS, ITeS and OTeS: all the components of the CLIMEbuddy solution are all based on wireless EnOcean standard. Furthermore CLIMEbuddy gives you simple and complete thermoregulation for autonomous heating/cooling plant adopting MSCM. centralized heating plant and radiators in column. with autonomous heating plant and radiators. eNRGmate™ is an open, flexible, scalable and non-intrusive wireless system devoted to guarantee the maximum comfort and the maximum saving of money and energy through the automatic optimization of the energy usage in houses, in small offices and shops. By means of eNRGmate™ the end-user will be able to plan, monitor and automatically control comfort, consumption and generation of different type of energy. eNRGmate™ is easily scalable and is suitable for every type and size of house. The installation is really easy, through the intuitive touch interface. Thanks to the wireless communication and the “no new wires” concept for power supply, eNRGmate™ systems are the easiest and cheapest (up to 70% less) way to realize retrofits in existing houses and a powerful “tool” in the hands of architects and designers to project refurbishments and new residential buildings. Thanks to the open interfaces, eNRGmate™ enables integration with third party products, so it can easily enlarge its control capabilities and directly integrate third party smart appliances. eNRGmate™ helps you to obtain the maximum EPBD class. So you will have immediate savings (up to 40%), tax reliefs and more value to your real estate. Through eNRGmate™ you will look forward: to new needs and the active interaction with Service Providers and the Smart Grid.